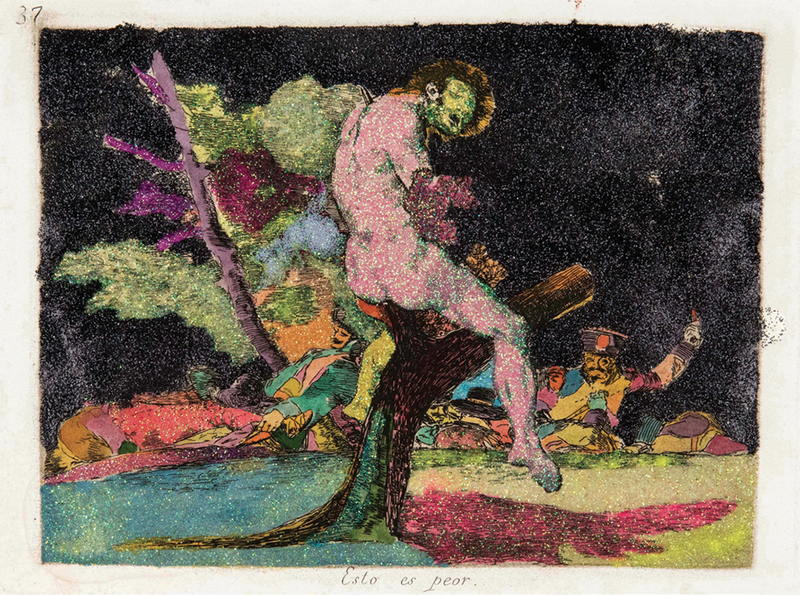 Jake and Dinos Chapman, The Disasters of Yoga (detail), 2017, eighty etchings from Francisco Goya’s “Disasters of War” (published 1863), glitter paint, this print 9 3/8 × 12 7/8". Jake and Dinos Chapman’s solo show “The Disasters of Everyday Life” channeled modern anxiety; the artists, known for their longtime dedication to the issues of organized violence, addressed the contemporary and historic imagery of terror. The exhibition consisted of a trio of works based on actual sets of Francisco Goya’s “Disasters of War” etchings (first published in 1863), as well as seven bronze sculptures of vests adorned with explosives: Life and Death Vests I–VII, 2017.